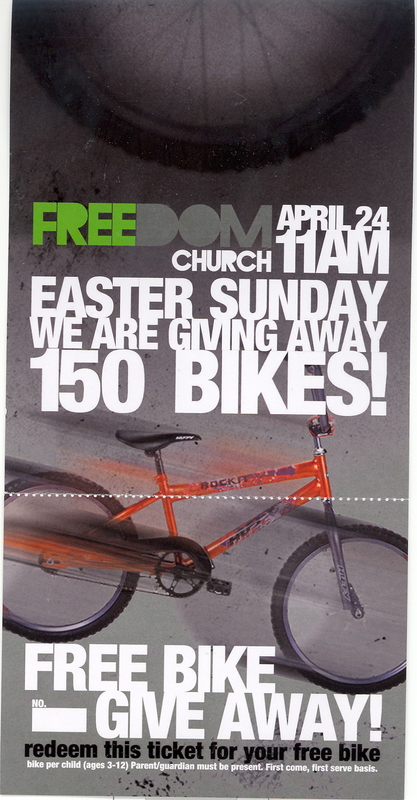 Go to Church on “Easter”- Get One of 150 Free Bikes! If you know some poor suffering child who cannot live without a bike; perhaps if he worships on “Easter” Sunday he will receive one… that is, if he is one of the first 150 who will be given bikes if they show up to the Freedom Church in Chatsworth, California for services. (See the flier below) Qualification? Bring a parent. Yeshua said we are all judged before the Father without His shed blood, but we are to be discerning. I ask you to discern whether or not this effort is one God has ever injected into His word regarding how He calls one to receive forgiveness from sin and iniquity. I know after I understood my sin, I was not looking for a bike, a TV or ?… I was moved by the holiness of God and my heart was filled with gratitude for what He did, not what I might get out of it. It was bittersweet and I felt broken yet hopeful. Nothing in this passing world would have been a comparable gift against the eternal life and living water that had just entered my life. Had I received a gift for hearing the gospel I would think it rather cheap grace.. why not something more for my time? What next, a flat screen TV? Where do the carnal incentives end for a spiritual decision? Then the question… is it a real decision? Where did all of those bikes originate? Were they given gratis from a corporation, or business? Would the community be better served to have them sold on eBay or somewhere else to feed or meet the needs of the poor in the neighborhood? Perhaps to do more laundry. In this writers opinion, this is not outreach, this is bribery. This is veiled coercion. How many parents will be dragged to the dojang/pub church looking for what they can get? They will not be looking for the gospel unless the Lord Himself is calling. NO man is seeking God, not one, without the prompting of the spirit. It doesn’t take a bike when the spirit moves, He moves like the wind and waits for a response. God is not a God of control but choice. Let us choose this day who we will serve. Let the decision be real from a broken and contrite heart. By the way- the free bike is for showing up… not for receiving the Son of God as Savior and Lord. Please pray for the sincere, that they would see the holiness of God and for those who want nothing to do with the true Messiah, but would rather have/give a bike for an audience. May God bless and teach the ignorant His ways.